I blew up my Duet…. I didn't really blow it up, but not far from it. Recently started stopping for apparently no reason, and I found today that the connector to power supply has melted!! Can anyone suggest why this is? Cartesian Prusa style machine with Mk2 PCB heater and E3D nozzle. 12v electronics. As always, these things seem to happen at the most important times! I've bought a new board and can only hope it gets here in time! Also, what is the connector part called for the power supply? I'll have to buy a new one and solder it on and hope my board still has life in it. I'm sure this is my fault, but I didn't realise my hardware could draw enough amps to melt the connector. I print PLA at 75c first layer, sometimes nGen at 90c first layer so nothing too strenuous on the heater. I am assuming you mean the 12v in on the duet. 1. "pre tinning" the wires going to the connector. Some people do this to make the wires neat, but, what it actually does is cause a bad connection over time because the solder crumbles under the crunch of the compression of the screw. 2. Not getting the screws tight enough. Make sure you are using an appropriately sized screwdriver that will let you get enough torque on the screw to have if fully seated and tight. You should then flex the wire and tighten it again. Finally, try to flex and pull it out. IT should not come out. 3. Using too small a wire. I use 14awg from the PSU to the Duet, but, if you use something way smaller, like 18awg for instance (common in very cheap chinese models) the wire itself might heat up, which heats up the connector. I'd also recommend using ferrules around the wires. 1 - I have heard about this. I just use the stripped wires in the connector, tightened till it can't come out. 2 - As above, Very tight. 3 - I use 13A mains wire so I doubt it's too small. I use the same for my heated bed. no sure on gauge but they are chunky. I'm very surprised actually. A year of Ramps 1.4 usage didn't see any problems like this (despite seeing it documented frequently) and have now seen it first hand but on my Duet after only a few months. I'm sorry to hear of your misfortune. Burned terminal blocks are almost always caused by the screws not being tight or working loose. As Qdeathstar says, tinning the wires makes it more likely to happen; but it can happen with stranded core wire even without tinning. That's why we supply the ferrules. I also recommend checking the screws are still tight several times over the first few hours and days of use. The connector is a 2 pin terminal block, pin spacing 6.35mm, current rating 30A or 32A. These are widely available. Hi, can you send/post a picture of the connector and the wire/insulation. Also do you know what current heated bed you are using (if its a fairly normal one for a i3 sized printer (200x200) going to 90C then its well within spec. 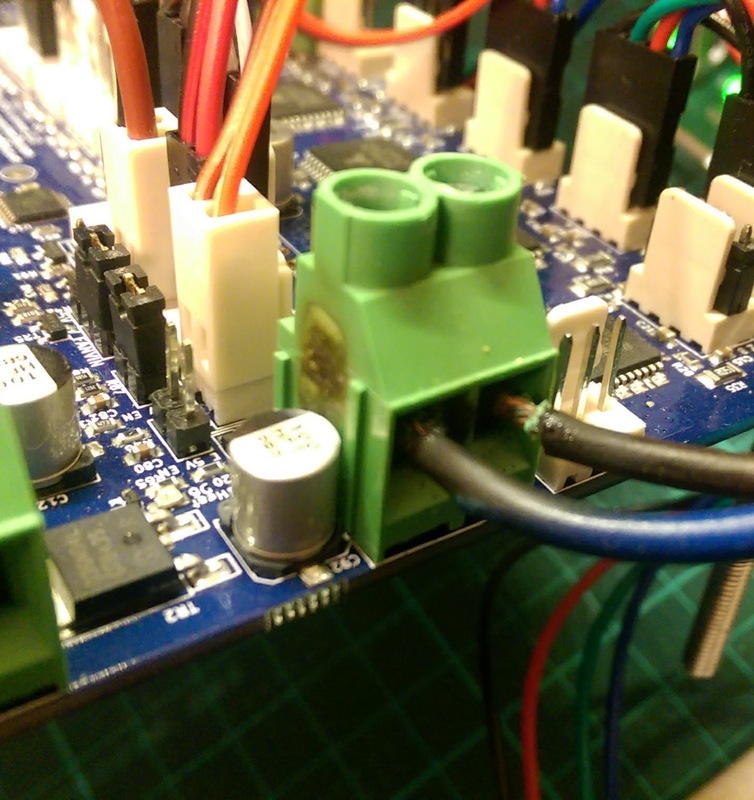 The heated bed should be the highest current draw on the Duet (hence why I am asking about it) however its also worth checking carefully that there is not another issue (for example a short circuited Always on fan that has also melted shorting Vin to ground. We tested the mains connector to 20A and they are rated to 30A, way more than your setup as described should be drawing. 13A mains wire works for a lot of people in similar printers however the standard 13A cable is 1.25mm^2, ~16AWG, ~18SWG. I would use thicker or double up, what power supply are you using? Updated: As David says: most likely to be the wire connectors however worth visually checking the board closely for other issues and anything that could short VIN to ground. Once I get the new board and can pull out the old one I'll give it a good check over. However, I'm still very surprised this happened on the V in. I checked the tightness of my heater cables and these were still fine since installation, despite being moving cables. (they are secured in several places so they don't flex anywhere important, but these should still be much more likely to work loose compared to the very short 3" power supply wires. I should have used the ferrules, but given the chunkiness of the wires used I didn't think too much of it. The heated bed is I believe a standard 12/24v mk2b 200x200mm pcb heater. (Maybe mk3). So as said before, nothing should be able to pull that much. Power supply is 25a. I hooked a new bed up as a quick test without adding the ferrules, so it was user error on my part. That's EXACTLY what my connector looks like right now, lol. Happened 3rd day into a filament that needed a bit higher temperature to print well. OP, was your board fine? Haven't had a chance to pull it apart and test yet. Couple of observations after looking at the OP's photo. Secondly, and I fully accept this may have nothing to do with the overheated terminal block - but noticed that the wiring of the stepper motor connectors do not match the phasing colour indicated on the Duet wiring diagram - I am a novice at 3D printing and NEMA/stepper motor wiring, so hold my hands up as I do not know how important it is to have the correct sequence to maintain phasing - is this important? For stepper connection it is only important hat one coil of the stepper is connected to pins 1 and 2 and the other coil to 3 and 4 of the connector. If the stepper is running in the wrong direction you either change one pair on the connector or change the direction for that stepper in config.g. Colors are not important. We can see only one side of the connection of the Stepper-Connections. That's the DUET-Side. And therefore it must not indicate any kind of wrong wiring. Maybe that is the real problem? To be honest, I think the issue was loose wiring. Proper use of ferrules and thicker gauge wiring has fixed the issue. My new Duet board has been running with no problems at all since last year.